Google is so fixed in minds as search powerhouse that it gets hard to keep perspective on how much different products and services they offer overall. And how much of your data gets in there. 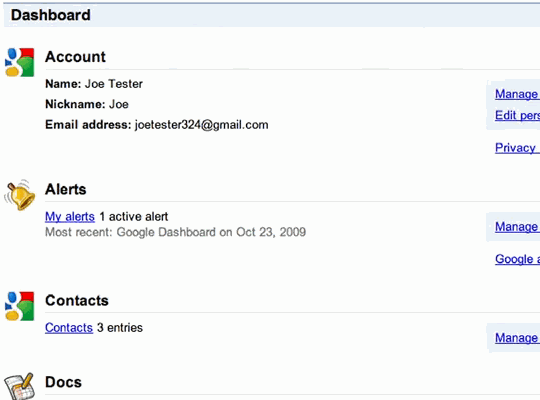 Google Dashboard is single-page overview of what of your data Google has. special icon marks data that is publicly available. For example it had reminded me that I joined some sites with Google Friend Connect as test long time ago and never did anything there. These are things that you won’t happen to remember and act on without such reminder as Dashboard is. Some items are especially impressive. It rocked that it showed name of my mobile phone and last time I synced it to Google. I don’t think this bit of information is available other than in Dashboard at all. On technical side Dashboard has some hiccups. Plenty of services are not fully integrated and simply listed at the bottom of the page. In my case most of them are from Labs, but it also includes such relatively major services like FeedBurner and Google Wave. For supported services sometimes data doesn’t seem to be linked correctly. For example it shows I am subscribed to one Google Group, but link there is broken and I can’t find confirmation anywhere else in settings. Simple and excellent data and privacy overview that it worth visiting not only once, but on regular basis.